“Cuppa Joel” on the air. At work! In his own precious element! And on the desk are just some of his music CDs. I owe him big thanks. He’s a volunteer. As we all are. Morro Bay, CA — Lucky me! I wish you could get to meet DJ Joel McMickell. Better still, I wish you could hear him on the air. What a good start he has given me. “Cuppa Joel” is his radio monicker. He is the morning man Monday through Friday on 97.3 FM, “The Rock.” Where I also have a show, hard to believe. Incidentally, Joel is the station’s all-important program director. Excuse me, it’s not at all incidentally. For good reason. Plus he is such a pro. He is upbeat, easy talking, polished. He’s been on the air since the day The Rock went live nearly two years ago. I thought he was an old, old pro on radio. Hah! Before that, to my surprise, Joel had a full career at a supermarket chain. He started as a high school kid stocking cans of peas and corn on the shelves and mopping the floors. He moved up and up and retired as an executive in that chain. Oh, he admits he was charmed by radio back in what he calls its Golden Age. Even got an FCC license when that was required and put in time as an after-work DJ. He says it paid so little it was really his hobby. He loved it. Anyway, I’m now an “air talent’ on The Rock. My second season. Winters I come here from Connecticut to this land of palm trees and ocean blue. No ice, no snow here. Clever of me, don’t you think? The main reason is that my loving daughter Monique and her hubby live here. Every Saturday I do a half hour I call “Gabbing with Old Guy John.” I’m that old guy. Very old guy. I interview somebody who will really gab with me – not just say yes to my questions, or no, or maybe – on a topic he or she is good on and which would be interesting to our listeners. Plus have value. I want our listeners to get something out of it! And I came to this new challenge amazingly raw and rough. All I had going for me was that I wasn’t bad at interviewing people. Boy, did I need grooming! And Joel has been my North Star. Over the years I had a teeny-weeny bit of experience on the mike. But always with an engineer behind a glass window. He monitored the dials and handled the switches. Well, of course, radio is hi-tech nowadays. To the point that the on-air talent has to be the engineer–watch and manage the dials, gauges, sliders, and of course the ticking clock. All while doing the show. Ain’t easy. And I’ve been s-l-o-w in catching on. Embarrassing and humbling. Joel has been painstaking in getting me up to speed. He has taught me the ABC’s. How to position the microphones for myself and my guest. Make the FCC-required ID announcement and disclaimer. Cue in the music that I chose to open and close my show (from “La Vie en Rose”). Also monitor the modulation levels on two gauges.Make a PSA half way through. Make sure we are on the air–everything, everything has to be watched!. And transition smoothly from the previous talent.Dr. Bob, to the one following me, Greg Cunningham. So have other talents helped me – Carole Truesdale (“Food and Wine”), who’s gone out of her way to help me; Dr. Bob Swain, a retired chiropractor (“Health and Nutrition”); Greg Cunningham (“The Sports Asylum” – I’ve never understood the Asylum part); Harry Famer (“Astrology”); DJ Wayne Benham (also the station operations manager); and others. All terrific talents. And generous to me. I’ve improved a little, but compared to them I’m still in kindergarten. By the way, that line-up gives you an idea of the variety on The Rock, though music is the biggie.That’s Joel’s specialty, along with other talented DJs. Again, all part-time and all unpaid. And as program director he oversees all this. Our station is extraordinary. Here’s why. As I said, it’s totally volunteer-operated. That has to be emphasized. From Hal Abrams, the founder and president and station guru, down to, well, me. Plus the station is non-commercial – no ads! It exists to be of service to our Estero Bay area here on California’s Central Coast, meaning Morro Bay plus smaller Los Osos to the south and even smaller Cayucos to the north. Yes, the station went live nearly two years ago and has been broadening and intensifying its listening base ever since. By the way it calls itself The Rock for the giant rock…a spent volcano… that rises big and high at our harbor entrance. It’s been called the Gibraltar of the Pacific! And yes, I said no ads! Sounds good. But it takes money to keep e small station like ours going.The flip side of that is, there’s no money coming in! That’s painful. So we depend on contributions big and small. Of course, they are mostly small. So fundraisers! Fundraisers! Well, so successful is The Rock that other small communities are querying how to launch a non-profit, non-commercial station like ours. You know, these days, radio not only broadcasts. It “streams.” That means that anybody with a computer or tablet or smart phone can pick it up just about anywhere. I even have a few friends in Connecticut and Massachusetts who listen in once in a while. No wonder I’m frantic to rise above klutz level. It’s Hal Abrams who made it all happen. His idea. He convinced the town fathers…and mothers. Chose and located everything needed. Arranged its location (in the Chamber of Commerce building). Got all the FCC paper work filed…and approved. Recruited talents. On and on. 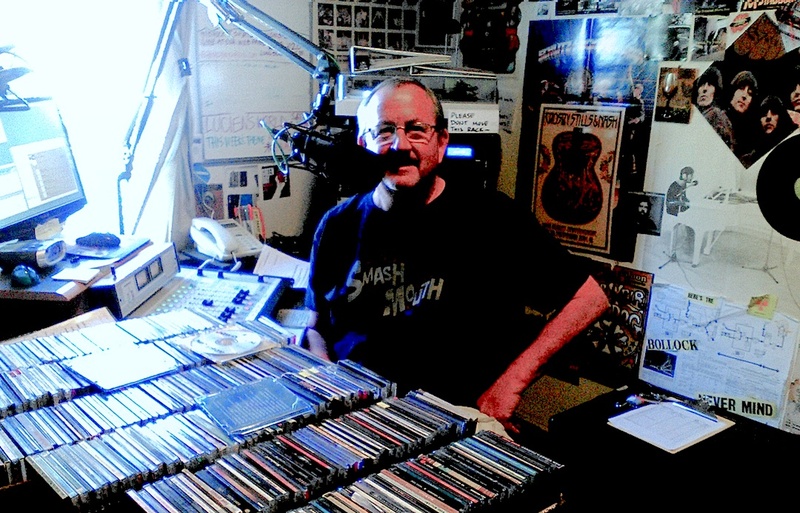 All while carrying on with his daily bread-and-butter job–producing and hosting (both with his wife Judy) the weekly “Animal Radio Show.” Which he founded at a single station and is now being broadcast by more than 125 stations across the country, and growing. Got to tell you I’ve had a string of very interesting guests to gab with. With more scheduled. A recent one was none other than Cuppa Joel. I got him on to gab about the many strategies and practices of supermarkets. Things most consumers don’t know about but should to get more for their money. We all use supermarkets. We all have to eat, don’t we? I myself even learned a thing or two from Joel, and I thought I was savvy. Last Saturday I hosted a Ph.D. oceanographer to discuss “Global Warning. In the next four weeks I have coming up the president of our Senior Center to explain a new bus service. Then an expert on “Home Sharing.” I mean, home sharing on an organized basis – it has marvelous implications nation-wide. Then a California Highway Patrol officer (one of 8,000 in the state!) who will chat about what they do and things drivers should be aware of. Then a retired scientist from Pfizer–in fact, he was a director there–who will talk about medicines…pharmaceuticals. Millions of us depend on pharmaceuticals every day. Who, I ask, wouldn’t be interested in hearing about that? So, imagine my pride and pleasure when I heard myself labeled the Charlie Rose of Morro Bay! Me, the Charlie Rose of little 97.3, The Rock! Well, I’ve got to come clean. I’m fibbing. That didn’t really happen. That came to me in a dream. A wonderful dream. Oh, I had another great dream: I’m in a cap and gown and receiving a doctorate in gabbing from Harvard’s internationally famous Radio Institute. And Joel and Carole and Dr. Bob and Greg and Harry and the others who have given me a hand are sitting down front and applauding! So now I’m thinking of locating a psychoanalyst to come on and talk about dreams and dreaming. I’d like a few insights about all that. Why such dreams? Why? What brings them on? I’m sure you’re wondering, why the heck am I doing this? I’m busy enough already. Well, it’s a challenge. It’s staying out of trouble. Becoming a small part of something good. Broadening my knowledge about many things. Being useful. Making friends. Getting to appreciate Morro Bay and fitting in. So, lucky me. Hey, money isn’t everything. Believe it or not. I know many don’t believe it. The talents that I know at The Rock do.